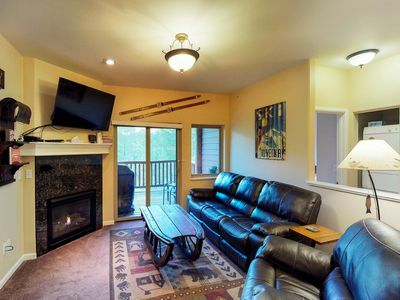 Private Room in Shared Ski Chalet - steps to Alyeska Resort on shuttle route. 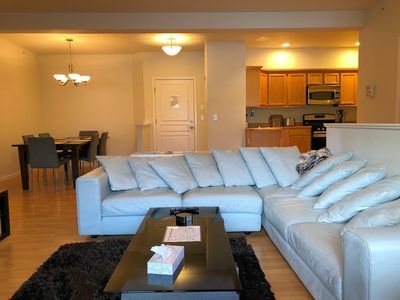 This is a shared living situation without private kitchen nor private bathroom. 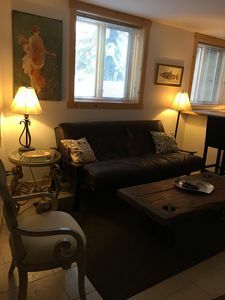 If you are looking for a place to stay in Girdwood that is affordable compared to other offered available accommodations, and if you can be pretty independent in a boarding house-type situation, you should check out this Huge loft room which can accommodate up to four people with a queen bed and a queen air mattress. There is a nice mountain view from the bedroom. 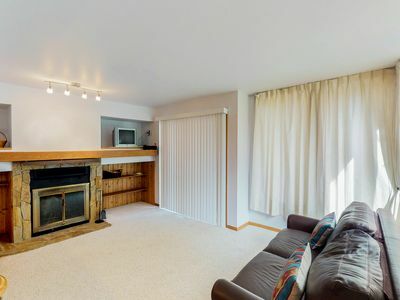 The loft is the only room on the third floor. 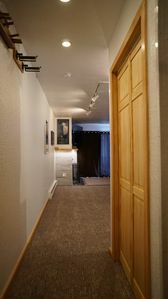 The loft is equipped with a mini refrigerator/freezer, microwave, closet and dresser space, night stands and floor lamp. Provided amenities include two sets of towels per person, four pillows per bed, extra blankets, shampoo, conditioner, body wash, and coffee. Easy check-in process – You’ll be able to self-check in. Kelli will give you check-in details prior to arrival, including a lock box code and you’ll be able to get in at your leisure after check-in time, at 4pm. 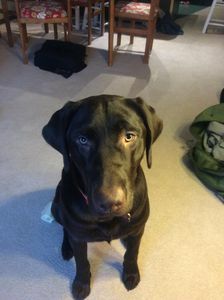 Ask Kelli for early check-in at no charge, if you’d like that, and she’ll do her best to accommodate. Great Communication – Kelli is known to be responsive to guests before, during, and after their stay. You can expect prompt responses to your questions. Kelli travels frequently, and some communication is difficult with the mobile app, depending on what your questions are, but she’ll do her best and can always at least get back to you within a day. Clean Room – Your room should be sparkling clean. The common areas of the house get professionally cleaned twice per month, but not necessarily coinciding with your visit. You should not have any expectations of the cleanliness level of the rest of the house. We have a very small bathroom to accommodate three rooms, including your vacation rental room, so the bathroom traffic is heavy, and while the long-term tenants have “boarding house” rules that they are supposed to adhere to, they are all adults who aren’t micro-managed. If anyone complains (including a vacation rental guest) about any of other tenants, then the issue will be addressed immediately. Kelli does not live at the property, so it shouldn’t be assumed that she knows about issues that exist. Please tell her so she can promptly react for the betterment of all residents. Any feedback is good for long-term improvement and is wanted, but not in the review stage – sooner is better so that your stay will be a better experience for you! As far as reviews go, we don’t promise a clean bathroom, or any other common areas because it’s a shared living space. 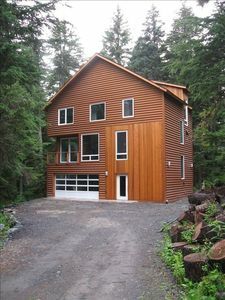 We have other options where we can offer that promise in Girdwood. Please inquire if interested. Super Location – It’s hard to beat! 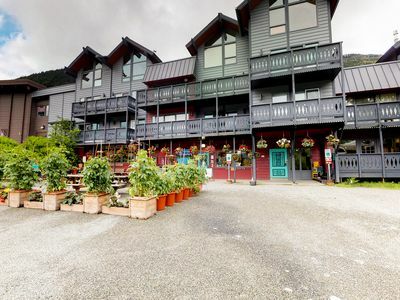 You can walk across the street to the brewing company, a half-mile to the resort, and three blocks to the Girdwood airport. 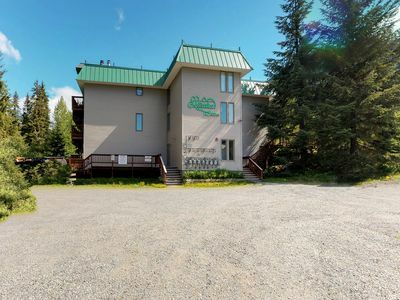 Loft at Alyeska is on the shuttle route, which is a free service that accesses all of the Girdwood conveniences – just walk steps to Alyeska Highway to catch the shuttle. Host, Kelli, has skied to the property many times, but you can't ski to the lift, as it's slightly downhill for the half mile to the house from chair 3. Realistic/Accurate description of what you should expect. Please limit your expectations to your check-in, your room space, and your correspondence with Kelli. Your use of common spaces including bathroom, kitchen, living room, coin-op laundry, and driveway, are a bonus. 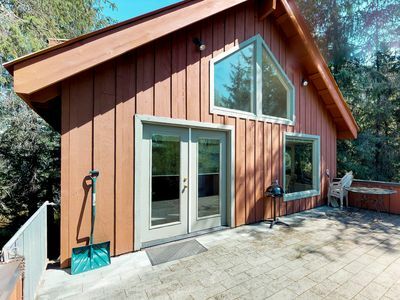 Your purchase only includes a private room in a great location, and also offers access to shared facilities with permanent tenants who are not associated with this vacation rental, and are also merely renting a room with access to common space. These tenants are not vacation rental hosts, they are customers just like you. 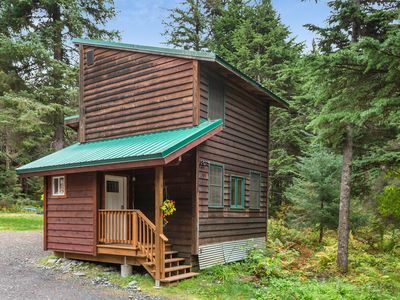 Great Value – It’s more affordable than anything else available in Girdwood, and we understand that it can seem expensive. 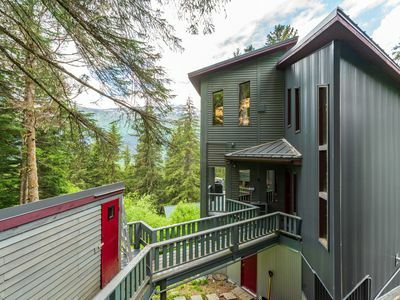 Girdwood has defined peaks and off seasons, so the property is vacant for long periods of time, which indicates a higher price during peak times, when the property can be rented. We have to charge more when the business is there, so that we can pay our mortgage. Otherwise, we would have to rent to long-term residents, which is what we’ve always done in the past, and still do for two rooms in the house. Kelli, happens to be a co-owner of a large tour company with over 20 shore excursions throughout Alaska, mostly in Southeast. 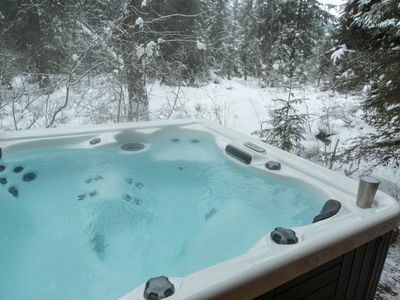 She offers 15% discount on all tours offered by Alaska Travel Adventures to her vacation rental guests. 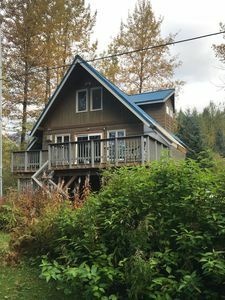 Popular tours offered include whale watching, salmon bakes, river rafting, kayaking, canoe tours, boat tours, hiking, gold panning, private cars, Mendenhall Glacier tours, Jeep tours, Alaska RV and Cruise tour packages, and more. If you are going on an Alaska cruise, or are interested in RV travel, ask Kelli for the details. 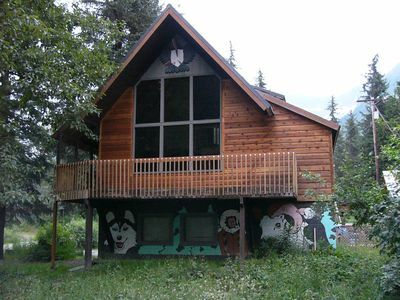 This property has an Alaska themed mural on the bottom level, which is the concrete block foundation. The cabin was built in 1964 and it was raised in 1978 when a concrete slab was poured and block foundation installed creating a gift shop where tour buses would bring people on their way to and from the sites. Later the lower level housed "the bike shop". When the bike shop outgrew the space, it was converted to a two-bedroom dwelling unit, but we decided to retain the mural, featuring a malamute, apparently the likeness of the local librarian’s dog at the time. 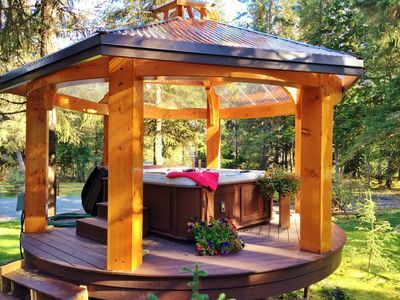 Luxurious Comfort, Privacy, Hot Tub and Sauna! NEW LISTING! 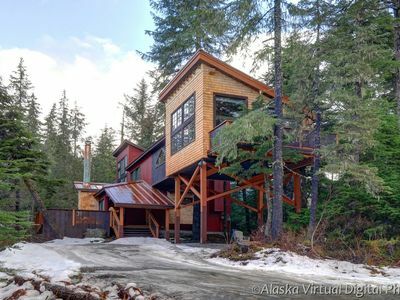 Cozy condo w/easy access to hiking & skiing - dogs welcome! 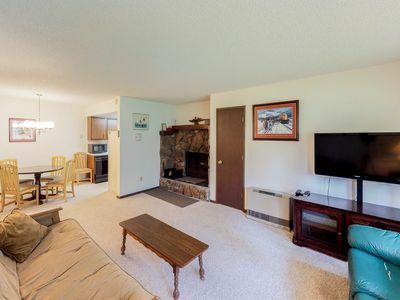 Dog-friendly condo w/ balcony & easy access to ski lifts! 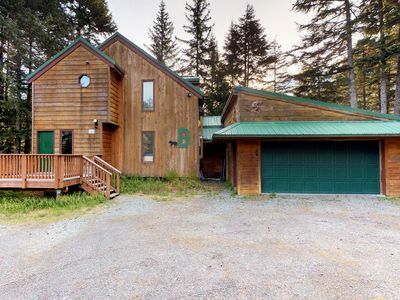 Quiet and secluded with mountain views... 1 mile to Alyeska Daylodge! NEW LISTING! 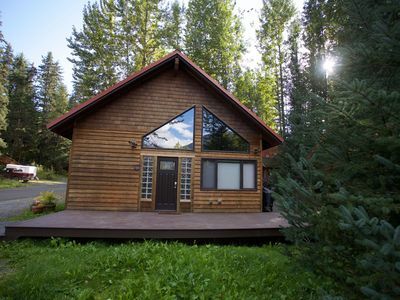 Quaint cabin with modern amenities located close to ski slopes!